Ray Davies continues to wear his English citizenship like a badge. The Kinks have often used American musical idioms — especially variations on Richard Berry's "Louie Louie," as revived by the Kingsmen and by the Kinks themselves — but Ray has regularly used his considerable songwriting talents to anatomize situations of class and culture that are peculiarly English. Years of touring, boozing, and occasionally brawling onstage with his lead guitarist brother Dave haven't diminished it. His nostalgia for the afternoon of the Empire, and his interest in the music hall/vaudeville traditions of his youth, continue unabated. His early efforts at the stand-up crooner idiom were often exquisite, especially "Sunny Afternoon" and "End of the Season," and most recently he has shown ingenuity in adapting fashionable rock currents to his obsession. Muswell Hillbillies, for example, used the idea that the cockneys are England's answer to the American cracker to validate a series of country & western essays that managed to maintain an implacably British flavor. Everybody's in Showbiz, a double album containing a studio and a live record, is Ray's first extended look at America. The new songs deal for the most part with touring, and with the difference between Hollywood stereotypes and American reality, the live record comprises hard rock and vaudeville material from recent Kinks albums performed with juiced gusto, high spirits, and occasional rank sloppiness. But the four sides hold together remarkably well, since most of the song situations deal with show business and its facade of tinsel and celluloid. While the Rolling Stones on their two-record set sing about a mythical American South to music that suggests a chemically augmented roadhouse band in some improbable Arkansas, the Kinks sing about an only partially mythical freeway to Hollywood. Their tunes roll and lurch along, with born arrangements that forcibly reminded an English friend of the BBC Northern Light Dance Orchestra, several Gilbert and Sullivan-style mock-oratorios, and a Buckingham Palaceful of vaudevillian quavers and music hall ivory tickling. Some listeners may find parts of the album revoltingly reminiscent of the kind of entertainment favored by their mums and dads, but Davies isn't just trying to become the new Val Doonican; in fact, he seems to be magnifying and exaggerating the excesses of show business in order to call attention to its essentially grotesque character. 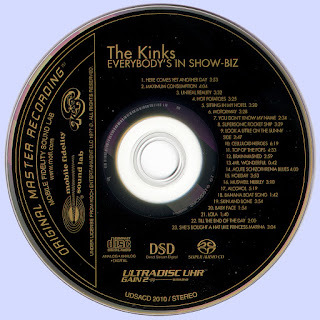 The album is not the homogeneously delightful sort of LP the Kinks were once known for; it has its ups and downs, its lapses and its masterpieces. The opener, "Here Comes Yet Another Day," is a fashionably bored touring song ("tune up, start to play/just like any other day") that rocks along nicely but has a curiously (and perhaps intentionally) unfinished quality; several of the breaks sound like a rhythm track waiting for a solo, and the tinny Toussaint-style horns don't help much. "Maximum Consumption" describes the touring rocker as a "maximum consumption nonstop machine" and compares him to the inefficient, gas-gulping, often quickly discarded American automobile ("I'm so easy to drive/and I'm an excellent ride"). Beginning with images of abandoned and undifferentiated consumption and moving into more specifically unappealing comparisons, "Maximum Consumption" is the thematic meat of the album. Musically it's excellent, with a deliberately loping beat and an excellent mix of Dave's slide guitar and the trad jazz horns. "Unreal Reality" has more of the "Mike Cotton Sound," a garish and determinedly awful trumpet-clarinet-trombone trio that's trebly and piercing and just right for the effect Ray's tunes convey. "Hot Potatoes" is a Davies domestic situation, cast this time in a mold that resembles a Little Eva record instrumentally and has excellent ensemble work by the band. "Sitting in My Hotel Room" is a bonafide Kinks Klassic, dreamily wistful with a beautiful melody and featuring "the exquisite Mr. John Gosling at the pianoforte." The Hollywood mystique and the reality of lonely hotel rooms and interminable turnpike driving collide head-on through much of side two. "Motorway" has the most memorably apt opening line of the album: "Motorway food is the worst in the world." It's a country rocker with nice finger-picking from Dave and a memorable organ riff from Gosling. "You Don't Know My Name" is another near-incomprehensible but strangely satisfying song from brother Dave. There's a "Going up the Country" flute break (seems both Stones and Kinks are picking up a few tricks from old Canned Heat records) and a schizophrenic structure that's unsettling at first but ultimately appealing. "Supersonic Rocket Ship" is quintessential Ray Davies. It invites the listener to travel the spaceways in a sort of flying Victorian music box that tinkles away with all the flavor of a period tintype. The words are quite explicit, and the following tune, "Look a Little on the Sunny Side," is even more so. The rock business is show business; a rock group running through its hits, trying to please an essentially frivolous audience, isn't much different from a stand-up comic in Las Vegas or Rex Harrison doing Dr. Doolittle or The Ed Sullivan Show. Ray isn't likely to win a lot of new converts by emphasizing this truism, but he makes it perfectly clear that on his rocket ship "nobody has to be hip/nobody needs to be out of sight." This goes a long way toward explaining why the Kinks are so durable; no trippy giggles here, no heavy metal warlocks, just "a round, unvarnished tale" with plenty of belly laughs and solid rock & roll along the way. "Celluloid Heroes" is the watershed of the album. It's a masterful, fully-realized six-minute cut with one of Ray's very best vocals and several of his finest, quirkiest, most original lines. Gosling, a relatively recent addition to the band, proves his worth with some tasteful, shimmering piano, and Dave, drummer Mick Avory, and bassist John Dalton contribute effective backup, with nothing out of place. The album could have ended here, but there are two more live sides. These sound at times like a juiced Jersey bar band with a semi-pro horn section chiming in. "Top of the Pops," from the Lola album, has contagious, raw power and an exciting feedback break from Dave. Ray clowns with Harry Belafonte's "Banana Boat Song," "Baby Face," and a mercifully brief "Mr. Wonderful." His performance of "Alcohol," one of the best tunes from Muswell Hillbillies, is almost scary. The Staten Island audience is obviously dominated by juicers and reds freaks, and they contribute shrieks and screams that are most apropos. Ray slurs his words and draws out the verses until it seems the whole band is about to fall headlong into the gutter. This is the definitive recording of the song, cutting the studio version by a mile. Ray's MC work throughout is like that of a popular British TV compere ... everybody's in show-biz. Despite its faults and its unevenness, this is a delightfully varied, endlessly entertaining album; its best moments equal or surpass the best rock & roll of the last few years. And the indications are that Ray Davies is just beginning to loosen up. 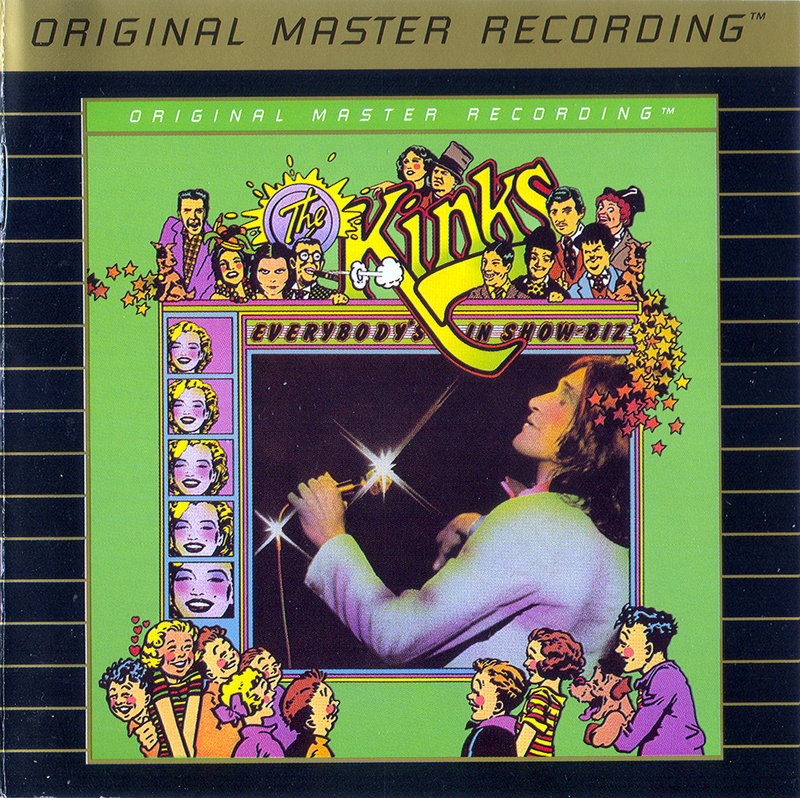 This is one of my favorite Kinks albums. Most of their 70s output tends to get overlooked but I find them all very enjoyable. Kudos to Ray for following his own muse, even when critics and fans appeared indifferent. But LOL, I can't find the link, how did you guys do to find it?